For the first time this past January the Department of Sociology offered a J-term course, Field Experience: Juvenile Justice Immersion, in which students are immersed in the Rhode Island Juvenile Justice System for five days. “It was probably one of the best teaching experiences I’ve ever had and I’ve been teaching for over 18 years,” said instructor Judy Van Wyck, professor of sociology and anthropology. Van Wyck said she got the idea to create the course in 2016 when speaking at Ocean Tides, a support system school that many male juvenile delinquents are sent to. 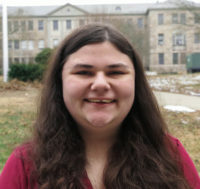 Van Wyck saw that students from other schools were visiting Ocean Tides and she felt that the University of Rhode Island could create a similar program. The University’s course involves more than visiting the school. Students observed Tide Family Services social worker home visits, shadowed teachers at Ocean Tides and followed a juvenile delinquent during a typical day. Students also sat in on juvenile court cases and spoke with the judge about juvenile justice. Each day students had to complete a written reflection and a discussion forum. Van Wyck felt that this experience helped students determine what they would like to do after college. One major assignment in the course involved students writing a paper about a career they observed during the course that interested them. “I picked students that were confused about what they wanted to do in their career,” Van Wyck said. “I hoped that they would see something in this program that would help direct them, and that did happen for many of them.” She added that one student from the class will have an internship at Ocean Tides because of the program and others will interning with Tide Family Services next semester. When asked what she thought was most impactful about seeing juvenile justice in action, Van Wyck said “The thing that stood out the most I think for the students was how normal the juvenile delinquents were. One of them has a younger brother, and she talked about how that (delinquent) could have been her brother. He’s done the same things, he just didn’t been caught.” Most of the juvenile delinquents that students worked with were often guilty of property damage or status offenses, although a few were convicted of more severe crimes such as sexual assault or attempted murder. Van Wyck also said that many students gained a newfound comradery after taking the course. 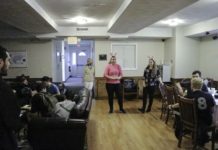 On March 1, the students held an open forum in which they discussed their experiences. Here, Van Wyck encouraged students to connect their observations to their sociology coursework. All students in the course were either sociology majors or minors. Ashley Bernhardt, a student that took the course, said the most beneficial part of the course was getting the in-field experience. “It’s so different than when you read about it in a text book or see it on TV, but when you see how it really affects people’s lives, it really changes you,” she said. Bernhardt said that she took the course because she was interested in working with children in addition to experiencing the criminal justice system. She also said that the course helped her think more about her career path. Another student who took the course, Yamaricelis Santos, said that seeing the juvenile justice system in action left an emotional impact. “What really got to me was the relationship between the delinquents and the trackers. Like they can joke with each other but they’re also serious,” said Santos. Santos also enjoyed interacting with juvenile delinquents in home visits and at Ocean Tides. When asked how taking the course impacted her future career path, Santos said that she initially intended to be a lawyer, and still does, but wants to be a lawyer that works in the juvenile system. Van Wyck says that the course will run again in January 2019. There will also be an information session in September for interested students. According to Van Wyck, about 30 students applied to take part in the course and 10 were accepted.